What’s Dov Been Up To? It’s been a while since we checked in on Dov Charney’s American Apparel. Regular readers know that AA is one of our favorite companies, perhaps even lean without knowing it, as Dov has figured out how to manufacture low margin clothing in Los Angeles, paying above minimum wage plus benefits, and still outcompete the Asian sweatshops. in stores in less than a week. Of course Dov is a bit of an odd fellow, to put it politely. me know that Dov had been spoofed on Saturday Night Live’s Weekend Update. Hopefully a video clip will soon surface, but for now we’ll have to live with a photo or two. Anyone worthy of being on SNL is obviously doing something right… perhaps. Apparently Dov started young. Last month a report and video surfaced of an pre-teen Dov discussing his early visions of capitalism while at a youth camp. Dov’s none too pleased. In 20th Century Chocolate Cake, a young Charney talks about how he hides money from the redistributionist staff at his "communist" summer camp and about how all the food in his care package was given away to ungrateful poors. Maybe Charney’s worried his childhood ramblings will tarnish the labor-friendly American Apparel brand. He should just be grateful he didn’t talk about anything else he may have done at summer camp. And those of you going to the AME Conference in Toronto next month can witness another Dov controversy… a rather edgy billboard. To put it politely. A small photo is to the right; visit the link for more, but still work-safe. 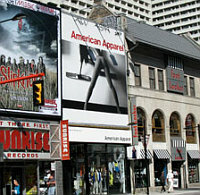 To top it off, in this case the photo on the billboard is a self-portrait of American Apparel’s lead photographer. Facing up to the criticism of the billboard, the company takes it even further to the edge. And we can’t forget the fact that several people have been intentionally spoofing the already edgy AA ads, including one discussing Barack Obama. Again, to put it politely. I won’t go further, except to warn the more sensitive among you not to click on the link. 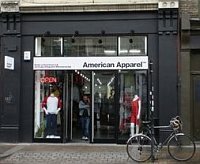 A couple weeks ago, while wandering around Zurich, Switzerland, I happened across on of American Apparel’s newest stores. In fact, it opened only two months ago, and is now one of over 200 retail outlets. Yes, the company is growing, and that is the most important news out of the land of Dov. hometown," [LA mayor] Villaraigosa told a group of American Apparel employees. Downtown headquarters, where about 5,000 people work. Yes, those of you even thinking about moving production overseas to take advantage of so-called cheap labor should be ashamed of yourselves. If a company can grow using "high cost" American workers to create low margin clothing products, then anyone can. While supporting immigrant rights… perhaps "compassionate capitalism"? And think of the fun you might have if you follow Dov’s example. Or even a SNL spoof. He hired Marsha Brady, so he can’t be all bad. I wonder if he found work for Cindy and Jan, too.